Is this Destined to be the Next Flappy Bird? You are here: Home › Gaming › Is this Destined to be the Next Flappy Bird? On the eve of the release of the iPhone 6, a simple fruit matching game is storming up the iTunes charts. 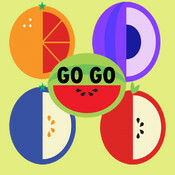 The app, GoGoFruitRush, is a free game that challenges players to make matches out of similar fruit. The more fruit you can connect in a single match, the more points you receive. Matching the fruit is easy compared to actually trying to put the game down. Itshighly addictive nature has been likened to recent fan favorites such as Flappy Bird, 2048, and Candy Crush. Downloads of the game suggest it could be poised to take the top spot soon enough. Released in April of this year, the app received marginal success until fate stepped in. The story goes that a guest at a recent A list party mentioned the game to Kim Kardashian West in a casual conversation. She later appeared to tweet her love of the game coupled with a shout out to her own app to her 23 million followers. The tweet is no longer available, presumably removed at the request of her public relations team. It only takes one tweet from a celebrity to propel a game (or person) to instant stardom. Katy Perry managed to do just that with a tweet to a Starbucks barista. In a similar fashion, GoGoFruitRush has been climbing the charts ever since. So will GoGoFruitRush ascend to the pinnacle of the iTunes charts? Only time will tell.